Looking for cool options to transform your dark room or outside area into laser tag area that is out of this world. These lights are bright and colorful and very cool. These Disco Balls are small and compact & can fill up the whole room, and make your room super festive and amazing. 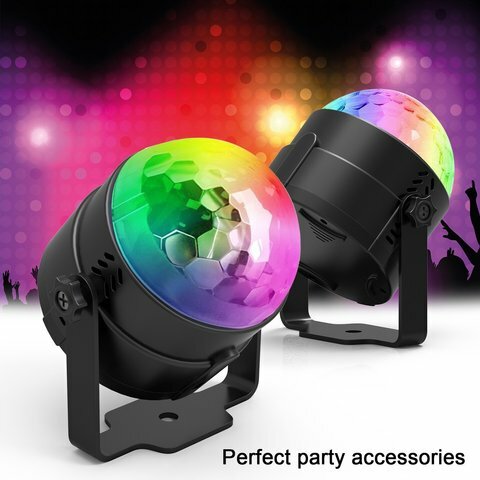 These are perfect for any parties - indoor or outdoor! They have been used for Karaoke, Wedding, Birthdays, Youth group events, church events, corporate team builders & more. Move side to side, circular motion while changing colors. It also strobes/flashes different colors. The remote is very easy to use with different presets you can't go wrong. The colors bounce and change when music is playing, it is sound activated.